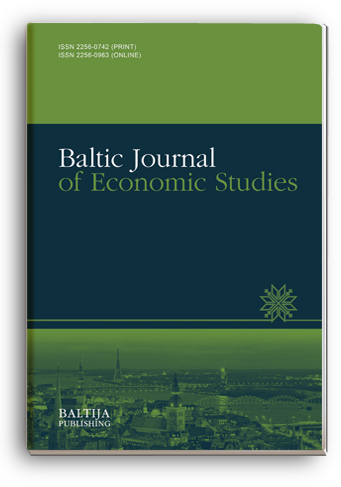 The Baltic Journal of Economic Studies is an interdisciplinary scientific platform in the field of economics, business management, national economy, structural and social policies. The scientific journal publishes original research and theoretical and practical articles on many issues of economic science. The main attention is paid to articles on the evaluation and analysis of the modern economy, the branch economy of local and foreign markets, the development of business strategies that further promote the direct development of the economy of Eastern Europe and Baltic states. Relevant issues of development and modernization of modern science: the experience of countries of Eastern Europe and prospects of Ukraine: monograph / edited by authors. – Riga, Latvia : Izdevnieciba “Baltija Publishing”, 2018. – 434 p.
Economic system development trends: the experience of countries of Eastern Europe and prospects of Ukraine: monograph / edited by authors. – Riga, Latvia : Izdevnieciba “Baltija Publishing”, 2018. – 546 p.
Development trends in medical science and practice: the experience of countries of Eastern Europe and prospects of Ukraine: monograph / edited by authors. – Riga, Latvia : Izdevnieciba “Baltija Publishing”, 2018. – 230 p.
Development trends in legal science and practice: the experience of countries of Eastern Europe and prospects of Ukraine: monograph / edited by authors. – Riga, Latvia : Izdevnieciba “Baltija Publishing”, 2018. – 220 p.
The authors of articles usually express their own opinion, which is not always comply with the editorial Board’s opinion. The content of the articles is the responsibility of their authors. The presented collective monograph is the result of the round table “Countries of the Visegrád Group: Results of Economic Interaction and Lessons for Ukraine” held within the framework of International Scientific-Practical Conference “Modern Global Regionalistics and Economic Entities: Directions of Influence” devoted to the 26th anniversary of the foundation of the Visegrád Group, as well as result of work of a group of authors united by a common idea to present the results of their research. The Visegrád Four – Ukrainian dimension. Integration – step by step: [Collective monograph]. Edited by T. Derkach. Riga, Latvia: Izdevnieciba “Baltija Publishing”, 2017. 308 p.
This textbook (manual) deals with up to date and debatable issues in the sphere of criminal liability. It includes generalized overview of crime issue, corpus delicti ant its elements, peculiarities of qualification and criminal liability individualization. Based on the provisions of Ukrainian criminal law and relevant aspects of common law countries criminal laws and judicial practice, and taking into consideration provisions of the European countries criminal laws and the European Court of Human Rights practice, this textbook reveals in a more detailed form the characteristics of corpus delicti, its elements and features, and their role in differentiating of criminal and non-criminal behavior. Special emphasis is given to issues of criminal policy, criminalization and the role of criminal legislation in combating crime, including aspects of harmonization with the ECHR practice. Contemporary status and perspectives of Ukrainian criminal policy further development are also analyzed herein. This textbook (manual) may be useful for all those interested in national and foreign criminal law issues and is fluent in English. Crime, Criminal Legislation and Responsibility: General provisions of Criminal Code of Ukraine, 2001 – a training manual – 2nd Edition. – Vyacheslav A. Tulyakov, Eugene L. Streltsov, Eugene Y. Polyansky, Elena N. Polishchuk. – Riga, Latvia: Izdevnieciba “Baltija Publishing”, 2017. – 104 p. – (Series: Study guides). The categories “IT Law”, “Information Security” are examined in the monograph, relations and interaction between these categories are researched. The theoretical basis of determination of the relationship between information security and IT law and the specifics of relations between “IT Rights” and “information security” are being analyzed. The questions are researched in the context of modern integration processes in Europe. Aimed at scientists, scientific-pedagogical staff of the institutions of higher education, post-graduate students, law students, practicing lawyers. May be of interest to everyone who is interested in the problems of “IT law”. Information security and IT law in conditions of integration processes: [Collective monograph]. Edited by O. Kharytonova, E. Kharytonov. Riga, Latvia: Izdevnieciba "Baltija Publishing", 2017. 178 p.